Properly maintained, hardwood floors can last many decades and well over 100 years. Proper maintenance is the key for making your wood floors last. If you think that your duty ends once the floors are installed, think again. Here are some of the things that you have to do to prolong the life and preserve the look of your timber floors. Regularly cleaning your floorboards will keep them shiny and looking fresh. Firstly, you should vacuum or sweep your floors using a soft bristled broom or the wand attachment on your vacuum cleaner. This is particularly important in high traffic areas like the living room and hallways. Doing this will help to prevent grit and dirt building up which can be destructive to your floors. Secondly, you should occasionally clean your hardwood floors using a damp mop and a hardwood floor cleaner designed for your type of floors. 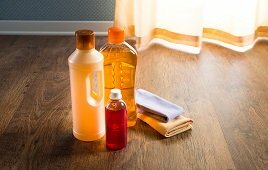 Natural, home-made floor cleaners can sometimes be used (like a mixture of vinegar and water), but make sure you do your research as too much liquid or the wrong proportions can damage the hardwood. All types of flooring are prone to damage. Here are some prevention tips that can help. If you live in a dry climate, consider using a humidifier in order to reduce the chances of wood shrinkage. Use a floor cleaner applied directly to a clean cloth in wiping off spills and spots right away. Keep in mind also that your pet’s paws and nails can scratch your floors. Fortunately, this damage is only superficial and can be easily fixed by buffing or, in more severe cases, a very light sanding followed by refinishing. If you really wish to keep the beauty of your floors for a long period of time, you need to have extra layer of protection. These include investing in high quality floor mats and placing protective pads under heavy furniture. Make sure that there are mats at all the entrances and exits as well as the high traffic areas. Not only do these items collect and trap corrosive substances — like dirt, asphalt, oil, sand and water — they also help to protect the floor from possible spills and scratches. In addition to the maintenance tips mentioned above, it is recommended that you also have professional floor maintenance. Some of the flooring maintenance services that you should take advantage of include sanding, refinishing and staining. The frequency that you should use these services depends entirely on conditions of the floor. If you’re not sure, best to seek the advice of a professional. If you wish to know more about proper floor care and maintenance, our professionals can help. With our skills and knowledge, we can provide you the information you need to know to care for your floors and we offer no obligation, free quotes. Does water and vinegar really work? I haven’t tried it, but read on several websites that it can be used on hardwood floors.